There are different ways to add items into your reading list depending on how you prefer to work. You might wish to gather items whilst searching the web or online resources,then add these to a list. Or if you know that the Library holds the resources you need, you can work in your reading list and add items from the Library catalogue. You can also import lists from reference managers such as Endnote. Once items have been added to a list, you need to tag them to indicate their importance level. 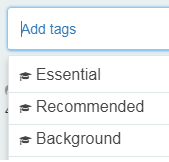 You can also use the tags to indicate if you want to move items into Key Texts or request digitisation of items. There's also the option to add notes for students, Library staff, or yourself. 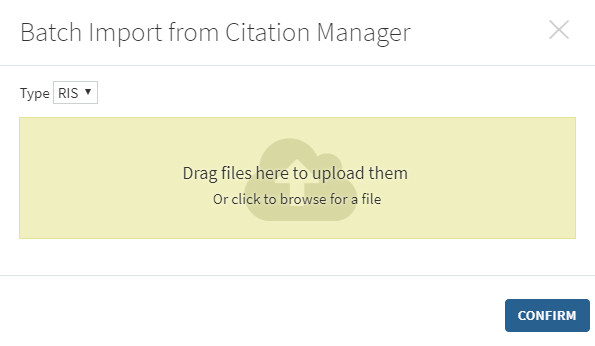 Add items via Cite it! To install the bookmarklet tool, click on your name in the top right corner of the Reading Lists screen and select Cite It! Then follow the instructions to drag and drop the Cite It! bookmarklet into your bookmarks/favourites bar. You'll then see it appear in your bookmarks bar. Please note: for user authentication purposes, Cite It! works best when you have the Reading Lists system open in another browser tab. You can use the Cite It! bookmarklet to add items to your lists whilst browsing the web, for example searching for books on Amazon, or articles on a database such as Web of Science. You can also add items from the results screen in YorSearch. If the item is already in the Library catalogue then there will be a green flag with the message Covered by your library. We recommend that you review the item information for accuracy and add any key missing information (for example the DOI number, if known). To edit a field, click into it and type in the correct information. This will help the Library in purchasing the correct edition for your list if the title is not already in stock. Select a list and section from the drop-down menu and click Add It to import the item details to your list. You can also add items to My Collection from here. Please note that Cite It! may only copy full item details from supported sites. A current list of supported sites can be viewed by clicking on your name in the top right corner and selecting Cite It! We recommend using My Collection to gather together items from the Library catalogue or the web to use in your lists. Click on My Collection on the left hand menu to view saved items. These will display in order of date added, but can be searched and sorted by title or author. Click on + Add Item to search the Library catalogue for items to save in My Collection. You can also add items to My Collection from Cite It! 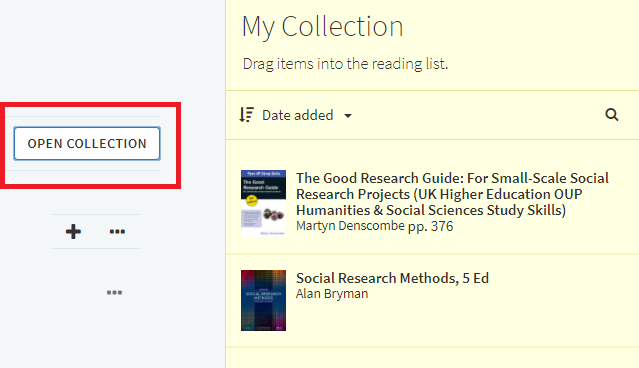 by selecting Collection (instead of choosing one of your lists) and clicking Add It. You can also create your own tags for items in My Collection, which can be used for filtering or searching. Please note that these tags are private to you, and will not be displayed when items are moved into a reading list. Click on the item to view details, availability, or to add a Private note. Click on the item options menu (⋯) to add the citation as a Suggestion to a list or to Delete from collection. When you are editing a list, you can add items from My Collection by clicking Open Collection. This opens your list of items in a pane on the right hand side of the screen, which you can sort or search accordingly. You can click and drag items from here directly into your list. Each item on your list should have a tag to indicate its priority. These tags are visible to students and may be used by the Library to determine purchasing criteria. Essential - all students must read this. We meet demand with electronic and print copies and digitisation. If requested, essential items may be moved to the Key Texts Collection. Recommended - all students are advised to read this. It is expected that students will read at least some material from this category and the Library will endeavour to purchase at least one copy of each of these titles. Background - students may choose to read this. We may not automatically purchase background items, but we will add items to stock based on student demand. Students should also be encouraged to use YorSearch to search the Library catalogue and use databases and journals in order to discover relevant readings for themselves. You can also tag items for digitisation and Key Texts (click for further information). You can provide additional information by clicking on an item and adding a note. Click on the + icon in the top-right corner of a list section to add items to your list by searching the Library catalogue. We’ve integrated YorSearch and Reading Lists to allow you to add items from the Library Catalogue without having to leave your reading list. Your can do this by using the ‘Add’ option. The default option is Search Library & Archives. If you’d like to use Search Everything you need to click on the drop down menu and select it. These two options replicate the different tabs in YorSearch. Search Library & Archives can be used for items in the Library catalogue (books, e-books, audiovisual materials), as well as exam papers, University of York theses and material from the Archives. Search everything also includes database material (book chapters, journal articles), York Digital Library records, White Rose eTheses Online and White Rose Research Online. Try to add as many details as you can to the search box e.g. title, author surname or year of publication. There is also an advanced search option where you can search by ISSN or ISBN if you know it. If the library has different editions in stock, then these can be viewed and added by clicking Additional versions available. Select the item you want and then you will have two choices: add it to a list (you can select which section from the drop down menu) or add it to your bag which allows you to save a number of references and then add them to a section of the list. If you wish to upload your own file into the Reading Lists system you are able to do this using the Create tab. you are the author and your agreement to publish grants you the right to re-use your material for teaching. If you would like a digitised copy of a print-only resource to be made available to students through your reading list then please add a digitisation request tag instead. See the Practical Guide to Copyright for further information about providing reading material for students, or contact your Academic Liaison Librarian for advice. You can import a list of items from your preferred reference manager software by exporting them in RIS format. 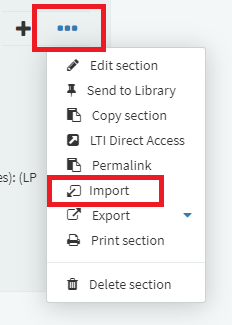 The items can be imported within a section of your list by clicking on the options menu (⋯) then clicking Import and uploading your RIS file. Your citations will then be imported to the section.